The United States Government has said it does not consider the Indigenous People of Biafra a terrorist organisation. Last week, the Federal High Court in Abuja gave a judicial backing the executive order of President Muhammadu Buhari, outlawing the group and its activities in the country. The court granted the order to proscribe the group on Wednesday. It declared that the activities of the group constituted acts of terrorism. The Federal Government also accused France and the United Kingdom of aiding IPOB activities. The spokesman for the American Embassy in Nigeria, Russell Brooks, told SUNDAY PUNCH on Friday that the US government does not view IPOB as a terrorist group. He said this in response to our correspondent’s email which asked if the United States sees IPOB as a terrorist organisation. Brooks stated further that the US was committed to Nigeria’s unity and would support a peaceful resolution of any crisis in the country. He said, “The United States Government is strongly committed to Nigeria’s unity. Important political and economic issues affecting the Nigerian people, such as the allocation of resources, are worthwhile topics for respectful debate in a democracy. The US embassy, however, declined to comment on whether the Federal Government had asked it to treat IPOB as a terrorist organisation and to block money sent to IPOB from the US. Brooks also did not state the US’ position on the agitation for a Biafran state. Speaking after the court judgment last week, the Attorney General of the Federation and Minister of Justice, Abubakar Malami, SAN, said the Federal Government would proceed to gazette the order proscribing the group. Meanwhile, IPOB in a statement on Saturday said that the Radio Biafra which is said to be based outside the country neither belonged to MASSOB nor its leader, Chief Ralph Uwazuruike. 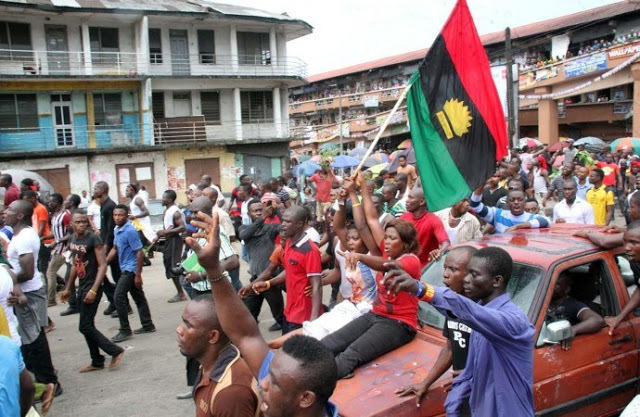 IPOB, in a statement made available to one of our correspondents in Port Harcourt, Rivers State, explained that though MASSOB assisted in funding the radio station, the arrangement only lasted from April to July 2009. The statement, signed by the Deputy Leader of IPOB, who is also the Deputy Director of Radio Biafra, Uche Mefor, noted that the station later went off-air and eventually shut down in December 2009. It insisted that MASSOB, which has since transformed into Biafra Independence Movement, had nothing to do with Radio Biafra. The statement added, “The entire humanity is hereby notified that MASSOB is not the owner of Radio Biafra. Uwazuruike is not the owner of Radio Biafra. Also, MASSOB on Saturday called on the Federal Government to immediately release its members who were labelled supporters of IPOB, arrested and detained by security agents. MASSOB said eight of its members were arrested by security agents on September 13, 2017, while they were on their way to Onitsha, Anambra State, to celebrate the group’s 18th anniversary. Its National Director of Information, Mr. Sunday Okereafor, told SUNDAY PUNCH that security agencies should have known the difference between IPOB members and MASSOB followers. Okereafor alleged that the MASSOB members were detained in Afara Prison in Umuahia, the Abia State capital. He added that his group had since its existence embraced non-violence as its method of agitation and wondered why police and soldiers would contemplate arresting and detaining them. He listed the names of five of the eight arrested MASSOB members as Igwe Ndukwe, Onyebuchi Nmeregini, I. Ugonna, ThankGod Udeh and Ugwu Emeka.